A magnetic resonance imaging (MRI) exam is a popular diagnostic imaging method in the U.S. and throughout the world. An MRI is normally an noninvasive, painless high-quality diagnostic imaging services performed at Envision Radiology. An MRI scan uses radio waves, magnets and a computer to generate high-resolution, detailed images of the inside of your body. 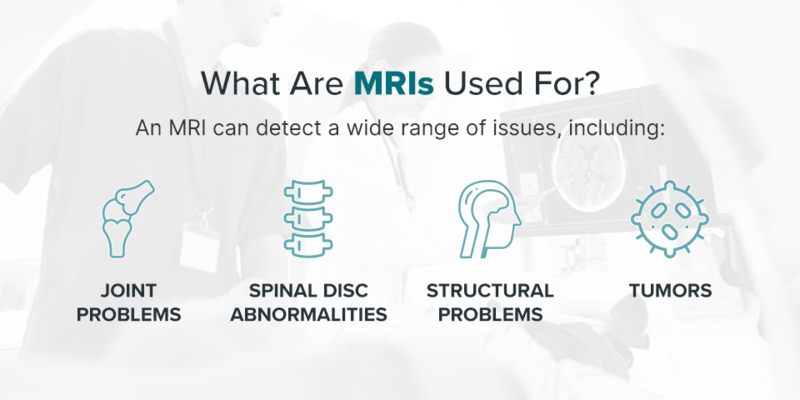 What Are MRIs Used For? Doctors use MRIs to gather essential information about your body’s internal organs and skeletal system, including your joints, spine and brain. They use the images to see if there are injuries to, or abnormalities associated with, your ligaments, nerves, bones, muscles and other tissues. Joint Problems: Doctors can often diagnose arthritis using an MRI. Spinal Disc Abnormalities: MRI is a useful method for detecting spinal metastases, spinal infections, disc abnormalities and nerve root disorders. Structural Problems: These may be brain injuries or problems in your heart. Tumors: Tumors can develop in various organs, such as your ovaries and kidneys. Doctors often use an MRI when they suspect an illness or injury that a CT scan, X-ray or ultrasound won’t provide enough detail about. Although getting a magnetic resonance imaging scan is not a fun thing to do, sometimes it’s a medical necessity. 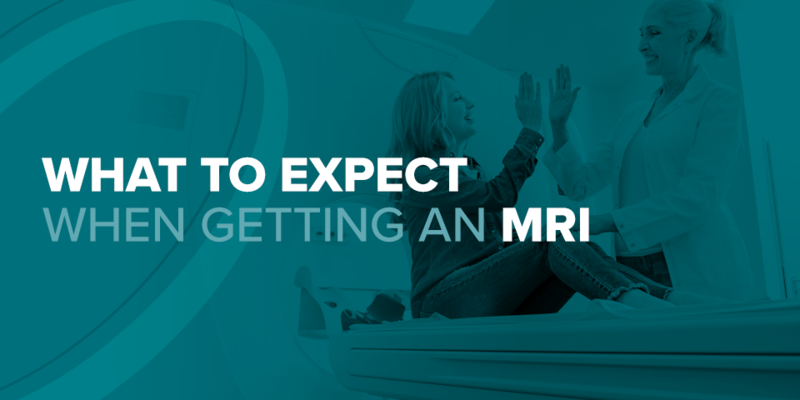 Most individuals want to know what they can expect before they get their first MRI, as it can be unnerving when you don’t know what’s going to happen. While it’s normal and common to have anxiety before an MRI, you won’t be as anxious when you know what to expect and how to prepare. An MRI machine has a magnetic field that realigns your body’s hydrogen atoms temporarily. Radio waves cause the atoms to create extremely faint signals, which help to make cross-sectional images. The images get layered on top of one another, giving your doctor a good view of your body’s insides from various angles. During your MRI, you’ll hear noises, and your radiologic technologist will provide you with instructions. If your physician orders your MRI with contrast, you’ll be fitted with an IV line to administer the dye. 1. Sounds: You’ll hear some loud thumping, knocking and tapping sounds coming from the machine. These noises are completely normal. You will be provided with with headphones that play music during your scan. 2. Remaining still and holding your breath: When you go in for your MRI scan, you’ll lie down on the table and will need to stay still. The machine moves as you’re positioned to obtain the clearest images. The technologist may instruct you to hold your breath at specified intervals for a few seconds, depending on what area of the body they’re scanning. They’ll let you know when you can breathe again, and you shouldn’t need to hold your breath for more than a few seconds. 3. Contrast dye: If the doctor wants to perform a contrast MRI, they’ll inject you with a material, like gadolinium, immediately before your MRI through an IV in your arm. Gadolinium-based contrast agents, which are rare earth metals, change the contrast of the MR image. During the scan, this material lights up, helping doctors get a better look at your heart, brain and blood vessels. It can help them with diagnosing issues like inflammatory conditions like multiple sclerosis or cancer. Typically, these effects last for only a few moments. According to the American College of Radiology (ACR), use of contrast materials isn’t “completely devoid of risk,” and some individuals could have side effects that range from minor discomfort to severe life-threatening, though rare, situations. The ACR says there’s a 0.07 to 2.4 percent adverse event rate for gadolinium-based contrast material. ACR also notes millions of MRIs are performed using contrast each year with no problems. It’s uncommon to experience allergic reactions or severe, life-threatening reactions, but they can occur in less than one percent of cases. A standard MRI machine is a large tube with openings at both ends. A magnet surrounds the tube, and the table you lie on slides all the way into and out of the tube. Although the inside of a newer MRI machine isn’t exactly luxurious, they’re less restrictive than they used to be. Also, depending on the area of your body the doctor wants to evaluate, you might not even have to put your head or entire body in the machine at all. Older machines had ceilings very close to the patient’s head and face, making it much more likely for them to feel claustrophobic during their scan. The newer MRI machines’ tunnels are bigger, and although you could still experience claustrophobia, you’ll have more space than what you would have before. You’re not completely inside the MRI machine in a short-bore system — the only part of your body inside the machine is the one being scanned, and the rest of your body remains outside the machine. All sides are open on an open MRI. The type of machine might work best if you’re claustrophobic or extremely overweight. Image quality with some open MRI machines isn’t as good as the quality with closed MRIs. Envision Imaging offers several options for your MRI procedure, including open MRI, MRI short bore, MRI open bore, MRCP and MRI spectroscopy. If you’re anxious about your first MRI, you can ask your doctor if sedation, anti-anxiety medication or anesthesia is a possibility beforehand. You might have access to a “panic button” you can press if you’d like to halt the exam. But knowing what to expect when getting an MRI, such as the sounds you’ll be hearing and the open tube you’ll lie in, can be helpful in relieving the anxiety some MRI patients experience. How long does an MRI take altogether? The entire scan might take anywhere from 30 minutes to two hours, depending on the complexity of the scan. Relax and close your eyes while the machine does what it’s supposed to, as you need to be still as the machine takes the images. The Envision Radiology technologist oversees the whole process and can talk with you through the speaker if you have questions or need to stop for some reason. They’ll do their best to make you feel comforted and at ease during the whole scan. There isn’t much preparation required for an MRI scan. Unless instructed otherwise, you take your daily medicines as you usually would. There could be some dietary restrictions for an MRI, but your healthcare provider will notify you of these requirements before your exam. Guidelines about drinking and eating before the MRI exam vary based on the exam itself. You might need special MRI preparations or considerations if you have certain medical conditions or items within or on your body. History of kidney problems: If you have a history of kidney failure, kidney disease, liver disease, kidney transplant or you’re on dialysis, you’ll need to let the technologist or radiologist before you receive the contrast. Contrast agents containing gadolinium might increase your risk of a serious but rare disease known as nephrogenic systemic fibrosis if you have severe kidney failure. Pregnancy: Gadolinium MRI, no matter what trimester of pregnancy, is linked with an increased risk of a broad group of inflammatory, rheumatological or infiltrative skin conditions, as well as neonatal death or stillbirth. Claustrophobia: Let your doctor know if you’re scared of an MRI due to claustrophobia. They might give you a sedative so you can relax. The radiology staff will then let you know whether you can have the exam done and if they need to modify it for your particular condition. You will be asked to change into medical scrubs (top and pants) or a gown to prevent injury from clothing. Leave jewelry and accessories home if possible or remove them before your MRI scan. Pacemaker: A small device the surgeon places in your abdomen or chest to control abnormal heart rhythms. Older pacemakers, until now, were thought to be susceptible to disruption when exposed to the radio waves and magnetic fields that allow MRI to view into the body. Skin Tattoos: Tattoo pigments contain ferromagnetic metallic compounds, particularly iron oxide, and could generate an electric current that could lead to an increase in local skin temperature serious enough to cause a cutaneous burn. Makeup: Metals in some cosmetics that may interact with MRI magnets. Therefore, you’ll want to forgo the makeup or nail polish on the day of your MRI. You should also refrain from using sunscreens and antiperspirants and minimize hair products — all of which could contain metals. Implanted Drug Infusion Devices (Like an Insulin Pump): The FDA has received reports of severe adverse episodes, including death, linked with using implantable infusion pumps in a magnetic resonance space. Cochlear Implants: Some individuals with cochlear implants feel discomfort and pain and experience issues with the internal magnet of the implants when they undergo an MRI. Metallic Prosthesis and Implants: Metallic fragments in your body can cause a possible risk of changing position and potentially causing an injury. Also, a metallic implant or another object could distort the MR images or cause signal loss. Other conditions and objects may interfere with an MRI or pose a risk. It’s essential you let your technologist and doctor know if you have a condition or object that is questionable. 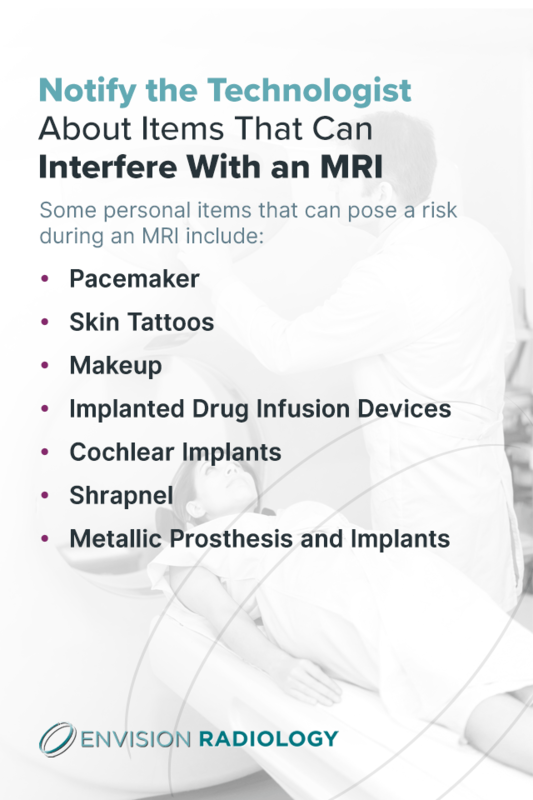 Since there are some neurostimulation systems, cardiac pacemakers and medicine pumps that are acceptable for MRI, your technologist must know the exact type, so they can implement special procedures and measures to ensure your safety. Once your scan is complete, the table you’re lying on will slide out of the MRI scanner, and the technologist will assist you off the table. When getting up from the table, be sure you move slowly to avoid any lightheadedness or dizziness from lying flat during the exam, especially if it took a while. The technologist will remove the IV line they inserted for any contrast administration — if there was any. If you notice any redness, pain or swelling at the site of the IV when you return home after your scan, let your doctor know, as this could be an indication of an infection or reaction. If you took a sedative for the scan, they might require you to rest there until it wears off. You will also need to have someone else drive you home. Otherwise, no special recovery care is required after an MRI scan. You can resume your normal activities and diet unless your doctor advises you differently. Your doctor may provide you with specific instructions following your scan, depending on your particular situation. 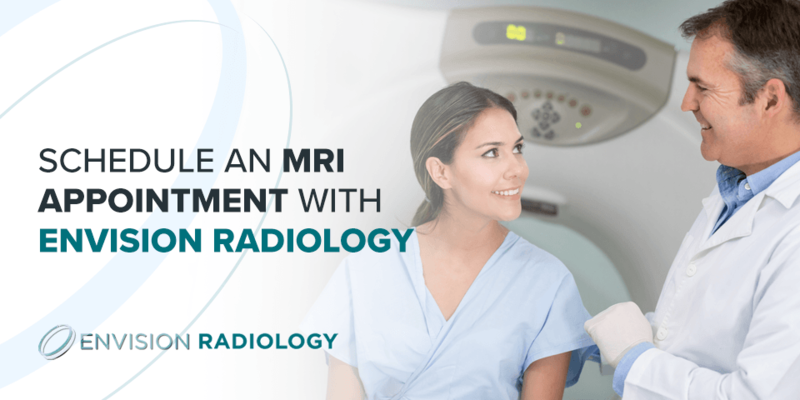 To set up your appointment for an MRI, contact Envision Radiology. Our providers are genuinely committed to enhancing your well-being and health through our hospitality and expertise. We ensure all of our patients have a special, memorable experience and are treated with the utmost respect. We make the timing and scheduling of your appointment as convenient as possible and provide our services in light-filled, elegant and comfortable offices. We also provide and maintain the most advanced and latest imaging technology, ensuring your MRI scan results are reliable and accurate. Contact our friendly and helpful staff today to schedule your appointment.